Thanks Miss Baldwin for her help and discusses a proposed meeting in Pittsburgh, Pennsylvania. Martha explains that her former students are living productive lives. She explains that there are no funds for additional students, and there is great need for help. There is a note asking Martha Berry to remove Mr. Robert W. Storer from the list because he died. 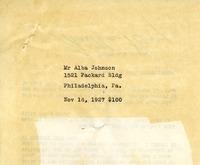 Mr. Alba Johnson sends a gift of $100.